Visualizing Variation is a code library of free, open-source, browser-based visualization prototypes that textual scholars can use in digital editions, online exhibitions, born-digital articles, and other projects. 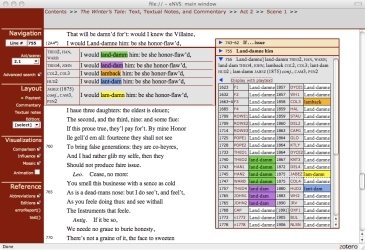 All of the visualization prototypes offered here deal with different aspects of the bibliographical phenomenon of textual variation: the tendency of words, lines, passages, images, prefatory material, and other aspects of texts to change from one edition to the next, and even between supposedly identical copies of the same edition. Variants are material reminders of the complex social lives of texts. Variation is most often studied in relation to literary texts, where small changes make big differences. However, variation can also affect the meaning of historical, scientific, legal, and other kinds of texts. Textual variants can be found throughout the history of the book, from manuscript books, to hand-press print books, to books printed after the industrialization of printing, to books printed yesterday. Understanding textual variants in their material, literary, and cultural contexts is central to the research of bibliographers, book historians, and other textual scholars. The Visualizing Variation project seeks to provide those researchers with the means to represent different kinds of variation visually, drawing on the simple yet powerful digital tools found in web browsers. Unlike some of my other projects, Visualizing Variation explores the possibilities of a digital humanities project whose principal investigator is also its lead programmer. It also explores the possibilities of doing digital humanities interface design outside the context of a single editing project, large or small, and outside the research support mandate of a university's digital humanities centre (though I am a faculty member in a university). Unless otherwise noted, all of the design and programming was done by me, though I credit others when I re-use their code. These prototypes are offered here in the hope that others will use them, improve them, and share the improved versions in turn. An important early claim made for digital scholarly editions was that they don't force editors and readers into choosing one variant over another. Instead of creating an implicit or explicit hierarchy of rejected variants subordinated to a single, supposedly authoritative reading, it was thought that digital editions could represent variants dynamically, presenting their ambiguity to readers not as a problem to solve, but as a field of interpretive possibility. Very few digital editions, however, have realized this possibility in their interfaces. One thing a digital visualization can do is make a virtue of ambiguity in ways that print cannot, combining the elements of time and motion to represent variants in ways that challenge the idea that texts are fixed and immutable. This group of prototypes uses animation to cycle between different textual variants, presenting them as a field of possibilities to readers, and hopefully inviting readers to consider the evidence for and consequences of different possibilities. Animated variants also drive home the simple yet unsettling point that textual transmission is more often a matter of change than fixity: texts sometimes change even when readers aren't looking. This visualization prototype was originally created for a complete interface I developed for the Electronic New Variorum Shakespeare project. 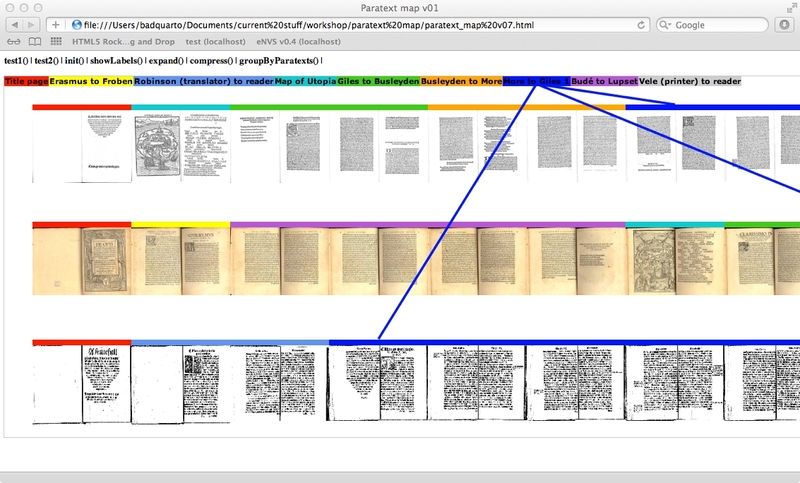 Currently I'm working to separate the textual notes visualizations as stand-alone components that can be used with other kinds of variorum editions. Paratexts are the features that define the social landscape in which a book was published and read. The term paratexts refers to a book's supplementary texts, including prefaces, dedications, epistles to readers, portraits, colophons, and other elements that accompany an author's text into the world. One might imagine paratexts as satellites orbiting the author's work; a more apt metaphor, however, might be paratexts as the succession of antechambers through which one enters the edifice of the author's text, a kind of architecture of the book that simultaneously invites and defers the reader's entry. Early modern books often have especially complex configurations of paratexts. These paratexts are valuable to researchers because they help us understand the social, political, economic, and aesthetic networks (sometimes multiple intersecting ones) that contextualized any given book, both for the book's producers and for its readers. However, those configurations of paratexts usually changed from edition to edition, and those patterns of change are difficult if not impossible to represent accurately in modern editions. 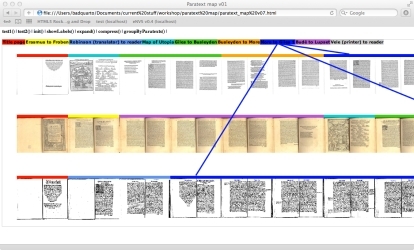 This visualization prototype allows digital editors to create interactive maps of the paratexts in a given book, as well as their relationship to paratexts appearing in other editions. Unlike topographical maps, however, this interface visualizes patterns in both space and time: the spatial sequence of paratexts in specific books, and the temporal sequence of paratextual variation over time in different editions. Together, these elements can provide a map of the bibliographical elements that shape a book's reception over time, and even in different publishing houses, countries, and translations. This prototype is my first experiment in image-based computing, and takes advantage of the animation and vector graphics capabilities of CSS3 and HTML5. Readers' marginalia are among the few material traces of the act of reading that we can recover, and their study has yielded insights into the history of books and the reception of texts. Although we often think of printed books as identical mass-produced objects, reader marginalia makes each annotated copy a unique artifact, meaning that researchers must often travel to different libraries to examine different copies of the same book. Yet as much as marginalia re-asserts the uniqueness of specific copies, it also connects books in networks of reception. This particular prototype was inspired by Owen Gingerich's study of annotation patterns in copies of Copernicus's De revolutionibus, in which he realized that readers of this controversial astronomical book were having a kind of distributed conversation in the margins of their copies. In other cases, readers have even responded to each other in the margins of the same copy. Both kinds of evidence, when gathered carefully and represented together (i.e. synoptically), can enable researchers to piece together the conversations that readers were having with the text and with each other. 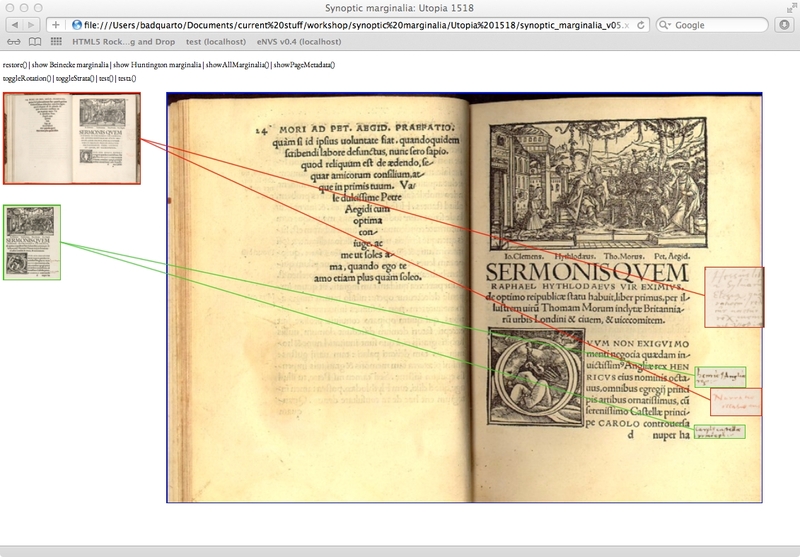 This visualization prototype provides a means for representing marginalia in different copies of the same book, even when those readers and their books are distributed widely over space and time. 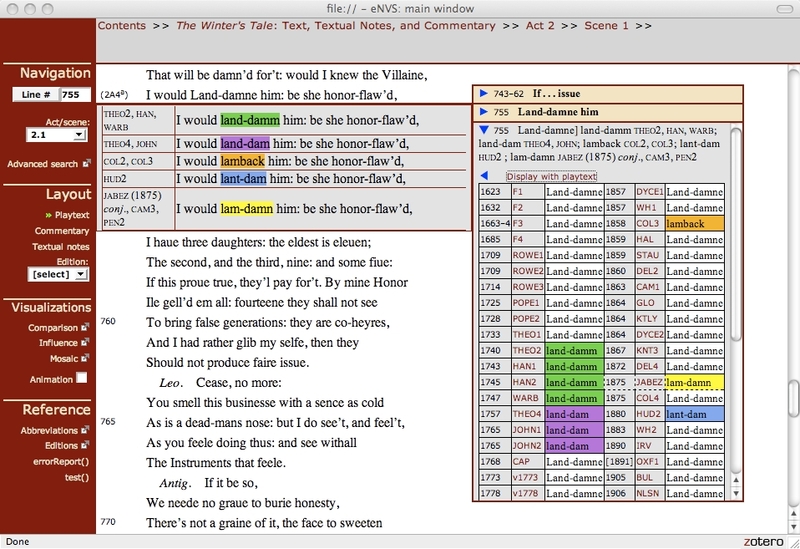 At present the visualization has two synoptic modes, one that arranges the marginalia together spatially (pictured here in its current rough form), and another that arranges the marginalia temporally, like geological strata (not pictured). The spatial and temporal dimensions of marginalia are best viewed in proximity, and the goal of this prototype is to enable viewers to move between those two dimensions easily. This is the second image-based visualization I am working on, and it uses many of the same techniques as Paratext Maps, above. All the visualizations are provided under a Creative Commons Attribution-ShareAlike license, meaning that you can use them in your project (commercial or non-commercial) provided that you share any improved versions under a similar license, credit me by name as the visualization's original author, and include a link to this website. I can be reached at alan.galey [-at-] utoronto [-dot-] ca. Please note that I don't have the capacity to provide technical support for these prototypes, nor to consult on specific projects or take special requests for new prototypes. However, I always appreciate hearing how the prototypes published here are being used and how they could be improved.